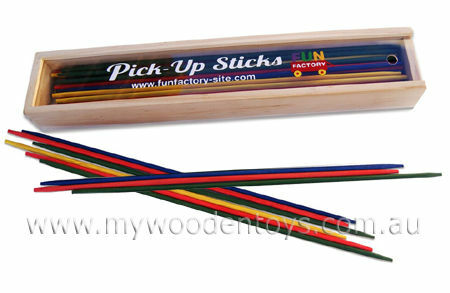 Mikado Wooden Pick Up Sticks in Box is a classic game nicely presented in a sturdy wooden box with a sliding perspex lid. This set comes with the classic 41 wooden sticks broken into blue, black, yellow, green and red all with different point values. Pick up Sticks sometimes known as Mikado or Jack Straws is a very ancient game attributed to both the Chinese and Native Americans. This set comes with full instructions. Size: Box is 26 cm long, Sticks are 24cm. Material: Wood, Water based Child-safe paint, Perspex Lid, Sticks have blunt ends. We like this because: "A classic fun game well presented in a lovely box."